The wayside pole with sculptures carved by Paweł Bryliński, Topola Mała. The reconstruction of the column with Christ Captured, Topola Mała. In Topola Mała by the old road from Ostrów to Odolanów (now Topola Mała No. 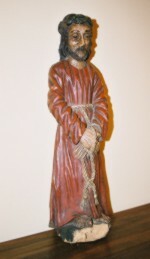 47) was a wayside pole with a figure of Christ Chained, crowned with thorns. It was on the field of Andrew Grzegorowski and his wife, Agnes nee Jędraszczyk. It was funded jointly by the Grzegorowski and Jędraszczyk families. Stanislaw Blaszczyk substantiated the presence of the pole with a photo (Fig. 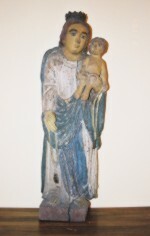 1), made before World War Two and assigned it to Paweł Bryliński's workshop. He emphasized its neoclassical architectural equipment and he assessed it as one of the prettiest and most original works of folk art. In the picture you can see flat-carved figures of saints which are placed in two tiers on the left and front side of the pole and supported on the consoles, which are characteristic for the workshop of Master of Masanów. The floors are separated and closed by a surrounding classical cornice which forms the basis of the three-dimensional figure of Christ located at the top. In front of the pole under the figure of Christ Captured there is a figure of Our Lady of Sorrows, below there is a statue of St.Roch, on the left side from the top there is a figure of St. John and underneath there is St. Anthony with the Child Jesus. Unfortunately, in 1941 the pole shared the fate of Polish chapels and wayside crosses which were destroyed by the Nazis. After the war an iron cross was erected in its place and it stood there until 1956. 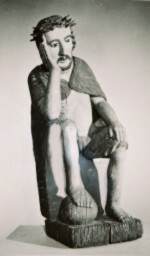 Currently, in the old place there is the reconstruction of the God's Passion of Paweł Bryliński (Fig. 2). 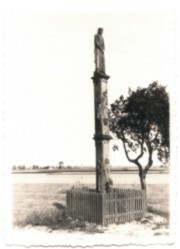 The copy of the pole with figures made by sculptors was funded by the Grzegorowscy family. The inhabitants of Topola Mała may, as their ancestors did years ago, on the way to the field repeat prayers before Christ of Nazareth, Mother of Sorrows and the saint patrons. Paweł Bryliński's memorabilia are also found in private collections and museums. In the photo (Fig. 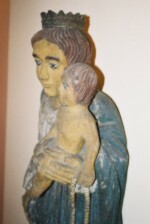 3) coming from a private collection, we can see alcoves of the façade in one of the houses in Topola Mała which are decorated with statues of Virgin Mary with Child Jesus and of Christ carved by Paweł Bryliński. Topola Mała. The facade of the house with the statues of Virgin Mary [Rosary] and of Sorrowful Christ carved by Paweł Bryliński. An old photo from a private collection. Mother of God [Rosary] with the Child (before the maintenance), the sculpture by Paweł Bryliński, Topola Mała. A private collection. A private collection. 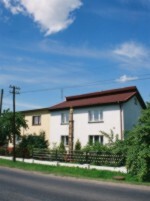 Topola Mała.